We love the Brooklyn Paper. It’s like the blog of our local print media. Their staff writes funny stories, they have good takes, and they tell us about very special things that we wouldn’t otherwise know about. 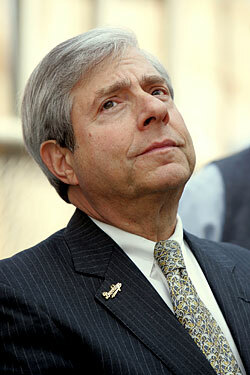 Like, for example, the competing menorah-lighting ceremonies in Brooklyn earlier this week. The Chabad of Brownstone Brooklyn and the Chabad of Brooklyn Heights both hosted events on Tuesday night to celebrate the first night of Hanukkah. 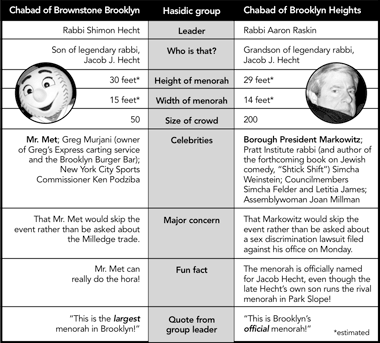 The gatherings, run by rabbis (who are in the same family) both claim to be the biggest in the borough and compete for the best guests (like Marty Markowitz and Mr. Met. No question who wins there). After the jump, the Paper’s genius tale of the tape comparing the contentious Chabad events. Of course, if they were really a blog, they’d have live streaming video of Mr. Met doing the hora.